In the burst of sunshine before autumn and winter we have opted for outdoors and walking. Hard not to walk with history here; the hills are steeped in it. Hill forts ring the coast like a necklace; craggy outcrops with flat tops, fortified walls, sometimes with the remains of hut circles. Local names convey confusion as to exact dates or perhaps confirm that these forts have been in existence for a very long time: ancient, iron age, Roman; perhaps having been all three. We walked through the nature reserve converted for and by the community. Once a tip, once a salt marsh used by the monks from Cymer Abbey to graze their sheep, the name of the road, Mynach Road, the only lasting legacy. A willow arch marks the entrance to an outdoor classroom used by the local school and a wooden pirate’s ship sets the tone for the children’s play area. Bees hum in the wild flowers and wild clematis rampages through blackberries. Along the prom, waves hit the breakwater, turn back on themselves and could teach a thing or two about physics as they explode with spume and ‘get’ us. White arms of a competent swimmer windmill through the treacherous looking waves and leave the feeling that we have imagined him till we see the rest of him, muscled and glistening, cross the prom behind us at a run back to his car. A section of shaly beach brings us to the railway bridge at Llanaber and up through the church yard of St Mary’s, also known as St Bodfan, St Bodfan and St Mary the Virgin and just St Mary. 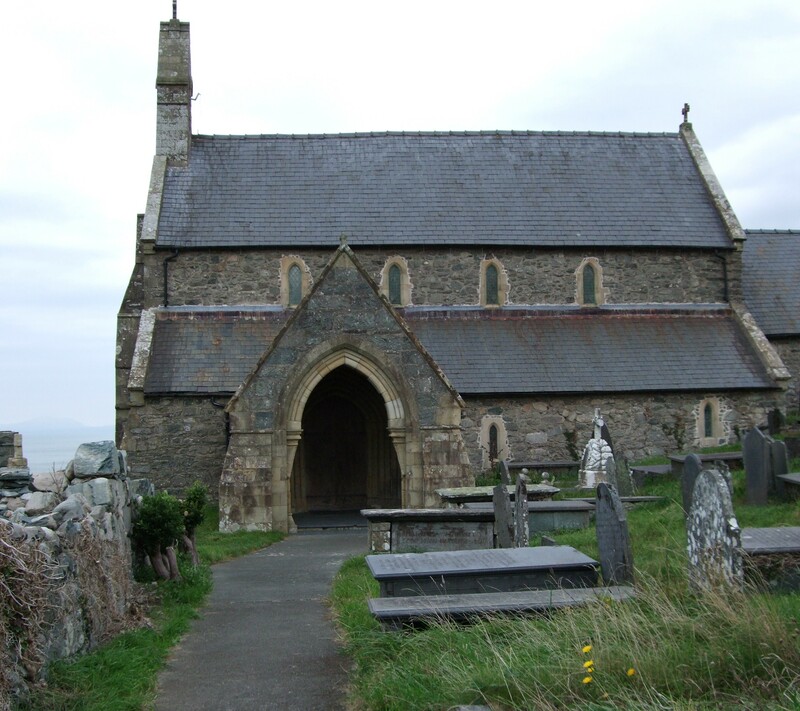 Bodfan was a monk on Bardsey, and founded the first church at Llanaber, probably wooden originally, lost without trace and replaced by the 13th Century church that remains. 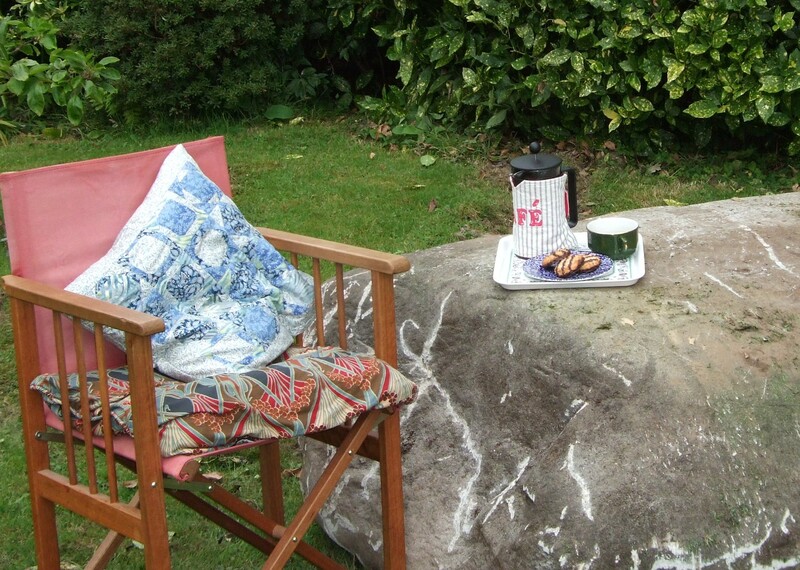 Inside are the Llanaber Stones, two Early Christian stones found locally fording a stream and believed to be from the churchyard . Reportedly Romano British from the 5th or 6th century the inscription is a mixture of Latin and Welsh. 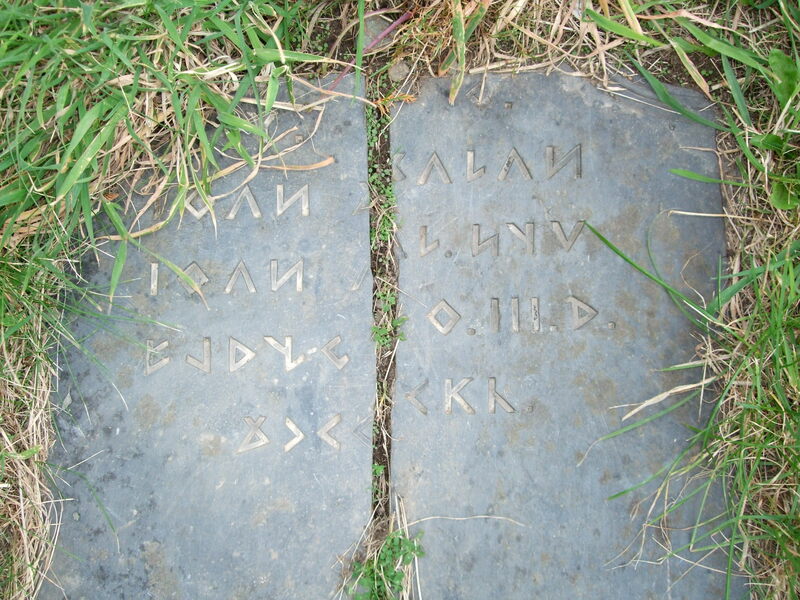 Both dedicated to St Bodfan; one is inscribed Calexti Monedo Rigi, a mythical king of Mona or Anglesey; the other inscribed Aeterna and Aeternus, brother and sister perhaps, names common in Roman Britain, they say. Churches also ring the coast line in plain view of Bardsey, the island of a thousand saints, whence the saints came to found or give names to the churches. Perhaps, once cast off from the safety of the shore, candles in the church windows guided through the buffeting sea, or. as today, when the sea, except for the breakwater, is so flat calm it is eery, kept spirits alternately up or at bay. As we leave the little chapel the sea mist gathers as the temperature plummets for evening reminding us that this sunshine is just a reprieve. 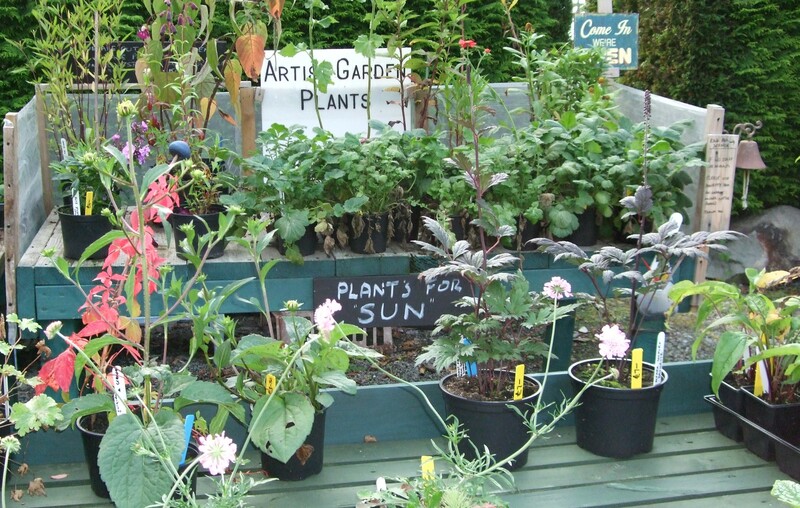 Two local gardens that back on to each other were ‘open’ to the garden club for tea, cake and beauty. Different styles; one wafting with flowers and interesting colour combos almost like a tapestry; the other, more of a small holding with hectares of land. Impossible to say which is more pleasing. The small holding with onions, fruit trees, a vine even, has a timeless feel as if village life has been enduring and will continue to for ever. 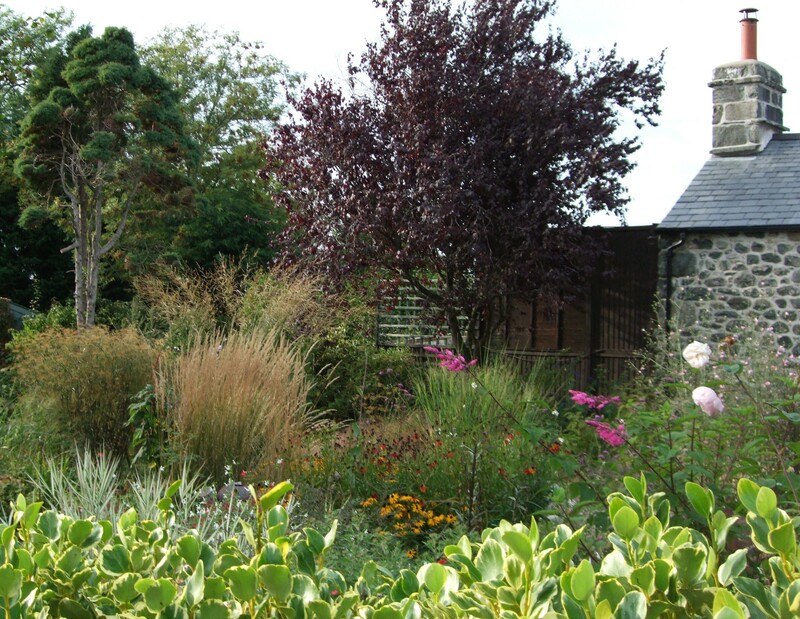 The flower garden is massively productive too with a small, tempting nursery. Both peaceful, a joy to be in and both massively loved by their owners and, no doubt, hard work. But passion for doing something stops it being onerous ( mostly). Our town expands exponentially in the summer. A plague of visitors strip the small shops and cafes and supermarket shelves and swarms the beach. We are glad to see them go, but still glad to see them . Tourists are essential to the economy, true, but locals are pleased that they enjoy the place. This year the weather was a joy so the best amenities were used to the full: strolls along the mile long prom; building castles on the expanse of sandy beach and waiting for the incoming tide to fill the moat before washing them away; crabbing in the harbour, snagging the line when the ferry putters past to off load passengers on the slimy steps and looking up to the backdrop of hills in the Mawddach Estuary. Memories are made of this. Rural Winter is long and hard. Once the night draws in there are no brightly lit windows to look in and dream like little match girls, no twinkling tower blocks to remind us we are not alone or theatre complexes to while away the hours before bed time. For the lack of light pollution we are rewarded with stars, the masters of dreams. 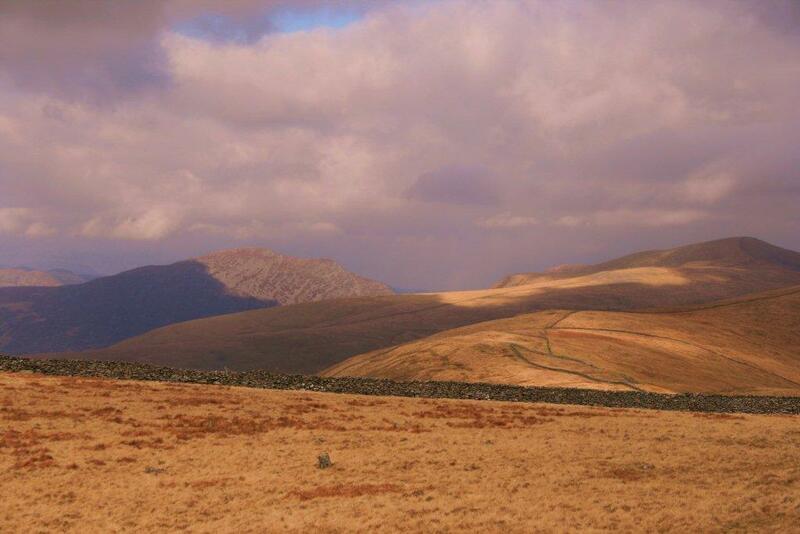 A walking festival : ten days to enjoy the best scenery with expert guidance. A jazz festival: a weekend with world class musicians. 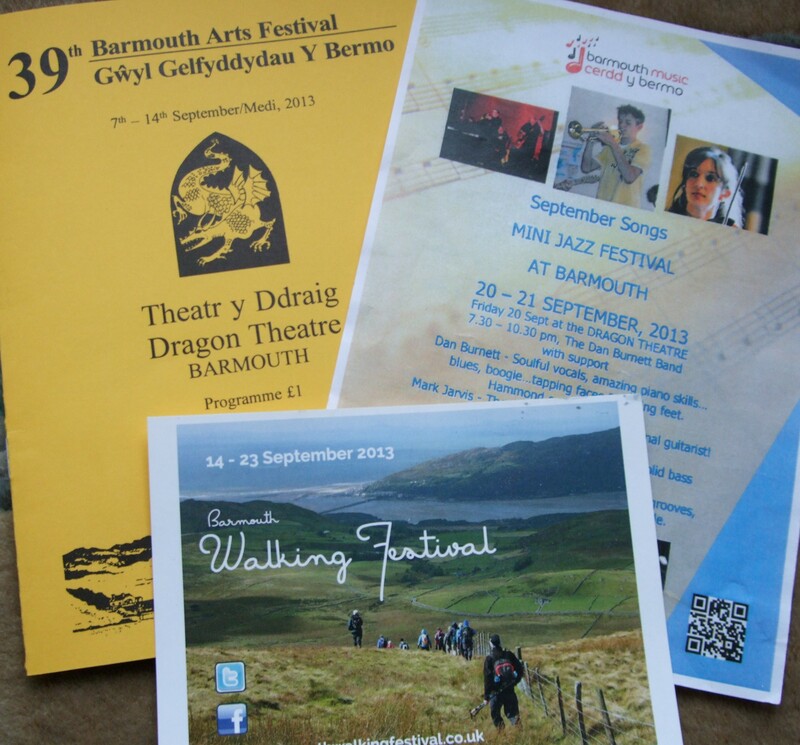 An arts festival: our small theatre is a blessing. The arts are not dead in the provinces even though there is no money for funding. These are not lavish productions but we are grateful to those who negotiate the slow train or the intricate tracery of roads to share their passion. We live on the edge. One step east, the land is so empty there is no sound at all except our thoughts dropping slow. One step west and we wet our feet in the gently lapping Irish Sea, and there is nowhere we would rather be. Not everyday of course. More often the sea rages as if in a tantrum over an imagined slight, and the wind roars across the land. Then we long for escape to the remembered hurly burly of city life we left almost a decade before. At least we think we do. Escape is not easy. Winding roads leading to and from the English/ Welsh border are too narrow for overtaking and cars stick behind lumbering farm vehicles: a joy for holidaymakers come to slow their heartbeat but a drag for those embarking on a long journey. A train potters up and down the Cambrian coast every two hours or so, so sedately it seems the train is as in love with the view as the passengers. Then, amid the human traffic of the metropolis comes the longing for that peace. Hiraeth, perhaps. All we need is heavy rain to wash away the marks left by the digger. 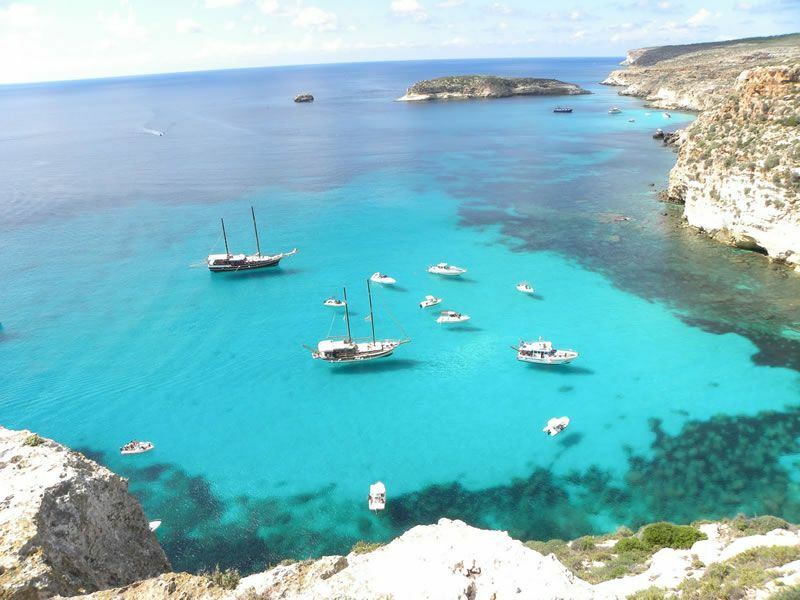 Lampedusa is a mediterranean island paradise with bleached white beaches and crystal turquoise water, good food and fresh, local fish. It is the extreme point of Europe, one of Italy’s archipelago, only 80 miles from Tunisia and an ideal holiday destination. It is known as a migrant’s island, and has been for some time, but t is not birds who migrate here it is people. Since the Arab Spring many more have tried, and many more have failed, than usual. Failure usually means death by drowning. Rickety boats, cruel seas and attempts to disembark to rescue vessels at sea, prove fatal. Success can mean a ticket to Europe via mainland Italy and a Schengan Visa. 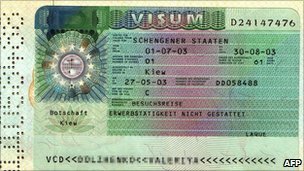 The Schengan agreement allows EU nationals free entry to those countries in Europe signed up to the agreement. – (almost free: it can cost up to £50 or equivalent) Non EU nationals do not have the same rights. It was agreed there should be no border checks on EU nationals, but non-EU nationals travelling inside the EU are a different matter. Reception centres for migrants on the island overflow and unaccompanied minors, of necessity, sleep outside on the bare earth. Lampedusa has promised to continue its tradition of welcoming people, but asks Europe to do the same. Earlier this year 22 people making the hazardous crossing from Libya to Italy who came from a variety of West African countries including Benin, Nigeria and Gambia, were rescued off Lampedusa when their motorised rubber dinghy capsized. Perhaps double that number were drowned. They were a tiny fraction of the 400 or so lost that day. These deaths barely raise a ripple on the world’s conscience. Not even the plight of the Somali olympic runner, Samia Yusuf Omar, who drowned trying to cross from Libya to Italy in April 2011. She was desperate to find an olympic trainer and her best chance probably lay in Europe and her only escape was by boat. Her story is a stark contrast to that of Mo Farrah, the Somali runner who moved to the United Kingdom aged 12 and triumphed in the Olympics. and only came to light when former Somali Olympic athlete Abdi Bile brought it up at a talk and Italian newspaper Corriere Della Sera investigated. Her story is told by her sister. The family heard about the death from some people travelling on the same boat. It is good and in the order of things to die for a cause or for a person, but it is wise to know for whom and for what, or, at the very least, to be sure that someone does. Perhaps fiction will soften our hearts where news has failed. ,lampedusa project | Théâtre Senza an international theatre ensemble based in Paris who create theatre about stories they feel compelled to tell, aims to raise awareness with the Lampedusa Project by gathering the stories of those who live on the island and those who try to reach it .